This one isn’t terribly ambiguous. As usual, I’ll welcome you to describe the kind of activity you’d build around this clip, including the kind of supplementary materials that would be useful. What is the best way to present this problem? What is the worst way to present this problem? WCYDWT: Water Tank from Dan Meyer on Vimeo. Dig that great meniscus at the very end!!! I doubt that’s really what you’re looking for in the WCYDWT department, though. Certainly some dramatic tension around 1:10 wondering if any water will start to flow out of the spigot. I like the refraction difference: The left side (viewer’s left side) of the center back wood does not appear to refract (nearly 90 degree angle) but the right side does show refraction. Right, so this is all interesting stuff, fun observations, etc. (I never considered the inflow / outflow idea.) But what are you going to ask your students to do? What material will they need? Well, my first thought is that I probably wouldn’t use that video. Why? Well, there must be loads of taps around the school you could use. Is it really that hard to just take the class outside? From there I’d have different containers; based on how long it took the first one to fill, they could figure out how long it would take to fill the others, and the target would be to internalise the link between volume and length cubed. Of course, that can still be done with videos. 1. I know you love bets. Show the initial video. Race to figure out when it’s going to be full (they’ll probably do it by looking at, say, how long to quarter fill). See which pair of students gets closest, well done, hopefully everyone gets how they did it. 2. (I’m assuming you made that video yourself) put the glass container on your desk. Place another one next to it – same shape, different size. Tell the class you’ve got another video of that one being filled, from the same hose. They have 3 mins to tell you how long it will take to fill, and be prepared to explain why. Allow them to take measurements. Decent starting point, or wrong tack altogether? But I feel like a more useful question is, “How much water does it hold?” I’d give them a video clip of the first quarter of the filling process. When they ask to know the flow rate, I’d give them another video of you filling up the measuring cup I saw you holding, including either timecodes or a stopwatch in the clip. From there they can figure the amount of water that went during the short clip, and from there estimate the total volume of the container. To do that they have two routes: Divide up the image into fractions and find the time it takes to hit their preferred fraction, or find some way to measure the actual container. (Which are, of course, the same thing. But I don’t think students see it that way. You could make that connection, though.) The best way to facilitate the measuring or dividing would be to provide a series of stills with their associated times. Give a bunch, like ten, so in providing the stills you don’t suggest the most important or easiest moments. Let the decide which still or series of stills to work with. – Show clip of measuring cup being filled. 1. Clip of filling a measuring cup. 2. Series of 10 stills printed on a page with the times from the video. 3. A picture of the bottom of the container where the capacity is, hopefully, printed. How big is the container? What is the flow rate of the water coming out of the hose? -Differential equations: letting the water run out; the flow rate out tends to be proportional to the height in the tank, leading to a differential equation. Advanced stuff, but I can’t help pointing it out. This one doesn’t pass the “so what” test for me. With the right group of kids you can make Frank’s grass growing video sparkle. But is it really worth the effort? What’s the larger context? What would make it intrinsically interesting to watch? I just reread Frank’s post. A great example of how a good teacher can use your clip and turn it into something interesting. For me its just water filling up a tank and anything I would try to do with it would be contrived. I guess that’s why we need a library of these WCYDWTs. Not everything will strike one’s fancy. I like Frank’s take on this; Andrew’s is good too, and might be where I’d go with it. I’m still struggling to make the question feel less contrived, though. Here’s a stab at something more real, but your students would have to be used to this sort of thing (ie. not scared to ask you questions, say they need more info, etc). Resources you’ll need to bring out when students ask: a diagram of your car’s trunk, a still shot (printout maybe) of the water tank with a ruler next to it, video of you filling a standard-size container (1L, whatever) with the same hose. When they have questions, answer them, giving just one piece at a time and making them see how far they can get until they know what they’re missing. Alex: Well, my first thought is that I probably wouldn’t use that video. Why? Well, there must be loads of taps around the school you could use. Is it really that hard to just take the class outside? Andrew: As you mentioned in the audio, you could ask, “How long will it take to fill up.” But I feel like a more useful question is, “How much water does it hold? Right. The teacher needs that photo (or at least that information) on hand somewhere. Steve: the flow rate out tends to be proportional to the height in the tank, leading to a differential equation. Advanced stuff, but I can’t help pointing it out. Shoot. I effed that up. I shot video showing me filling up a measuring cup from the valve but I completely missed the fact that the flow rate is going to decrease. I don’t want to be too cheery about my strike-out there, but this could be really good. My students will do the same thing. The fact that their guesses are so far off will frustrate them and that frustration will make them want to know why. Then we’ll pull a Rhett Allain and fix a tracker to the water level at ten points in the video and GRAPH THAT THING. Frank: If a group wishes, they may get as many additional screen shots (with clock reading) from the movie at any time they wish. But here’s the catch: The longer they let the video play past the 1 minute mark, the worse their score for the competition. The more accurate they are, the better their score. Awesome scheme. You’re a mathematical Machiavelli. And re: boredom, the boredom is entirely the point. We want students in an exasperated stance, checking their watches, wondering “when is it going to end?” Because that motivates the math. CLIMEguy: This one doesn’t pass the “so what” test for me. No way you’re reading the same comments I’m reading. I’m not quite sure what you’re saying. Is your order of operations find the volume of the container, then ask for the flow rate, then find the time to filling? I was thinking that the easiest way to answer the time question was along the lines of Frank’s activity. Just time a certain fraction and then multiply to get the total time. This seemed too easy to me. I was thinking that the volume question forces the students to seek the flow rate, adding complexity. But I might be interpreting your path backwards. Estimating time is just about the same skill as estimating volume, I think. We’re more familiar with time so it’s easier, but I don’t think it would be a huge difference. I do think the video creates a certain dramatic tension for the time question. I chose a math sequence I liked over the drama. Of course, I defer to your repeated experiences with making big questions. When you’re developing a lesson, is there something about the two questions that distinguishes them in your mind? Or is it just a gut feeling driven by trial and error? Dan: No way you’re reading the same comments I’m reading. No, I read the same ones you did. After watching the clip I agreed with alex’s initial comment about why would you use this tape — when there is so many others to choose from. I still probably wouldn’t use it, but I love what everybody else did with it. That’s what makes your WCYDWT curriculum idea so powerful. I would like to share with you something from Keith Devlin’s MAA article Is Math a Socialist Plot? that seems relevant to this discussion. Faced with filling the water tank, what you, and I, and everyone on the planet would do, is turn on the water, watch for a minute or two to get a sense how fast the water level seems to rise, then do something else nearby, checking periodically on the progress until it’s getting close to being full, and then watching it until it’s done. In the real world in which real people live, no one uses mathematical formulas in their day-to-day life; not in the daily stuff of living. What they often do find themselves doing is using a device or a smartphone that depends on math. Why, oh why, resort to fake “applied problems” when there are plenty of real ones? Even in the case where you can’t find a genuine application of some mathematics, it’s not hard to imagine a plausible one. 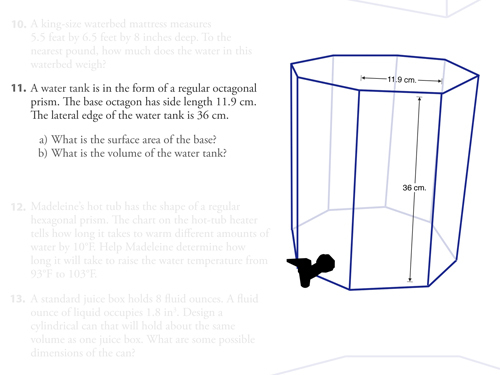 Instead of asking students to carry out the water tank problem with an unrealistic scenario, say that their boss wants them to develop a small automatic valve that can be set to turn off the water when the tank is full, or that he has asked them to develop a smartphone app or a website calculator that can be used to determined when to turn off the water. These are formulations that will seem relevant to the students. The students will, of course, end up doing the same math! You’re just presenting it in a plausible fashion. Though the suggestions you offer are more “real/relevant” they are still are contrived and may interest some students, but I don’t find them intrinsically interesting, and thus not passing my “so what” test. [In another post Joe Henderson describes them as “Who Cares?” scenarios.] Since you can always find students that find almost anything related to math intrinsically interesting, let me give you an example that makes my point. At this point I turn to the class and ask them to tell me if they see any problems with the “Costello method.” Most the time particularly 6th graders will tell me that he is putting numbers in the wrong place. When I ask them why they are in the wrong place very few can come with a good answer like “Ah, he’s just fooling around with place value. In case you are interested here’s my lesson (that definitely needs updating) that goes with it. Now of course there are a lot of videos out there that entertain, but wouldn’t work for me in a math classroom. What I’m always looking for are learning objects that will get kids’ (particularly middle school) attention. Then hit em with an engaging question that takes advantage of this momentary teachable moment. I have to ask, how many times did you have to fill up that tank before you got someone to stop and talk to you? While it may not be mathematical, I think it would insteresting to have students predict when the gentleman you are speaking with will leave. I only filled it up one time and Ron came over to see what it was all about. He wasn’t too disturbed by the whole thing which was nice. Did you ever have a student notice that they could time how long to rise an inch and then multiple that by the height in inches? If so, do you loss them on wanting to calculate the volume?